$250 / night - Five consecutive night minimum for mid May thru mid October; plus 2 weeks Christmas holidays. The rest of the year $230 / night - Two night minimum stay; three night minimum for long weekends. 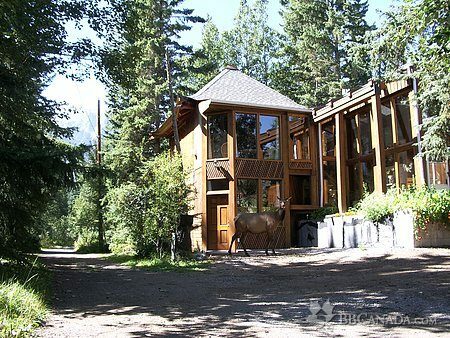 Our private entrance B&B borders the quiet river forest in the heart of Canmore, which is centrally located accommodation for the Banff, Lake Louise, Kananaskis recreation areas. Take a refreshing wet steam (or whirlpool tub) in your room, then walk 3 minutes to downtown Canmore restaurants and shops, or instead to a quiet stroll along the Bow River. 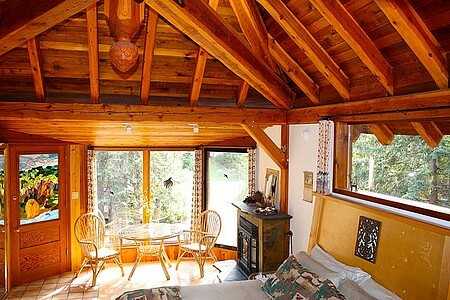 The Treehouse and Foresthouse are attached to our home via the greenhouse common area. Both suites have 8 full length windows, private entrance, ensuite, king size bed, wifi, TV/DVD, gas fireplace, bar fridge and sink. As the name implies, we have designed and built everything ourselves and take pleasure in creating every detail from stained glass to hidden dragons. 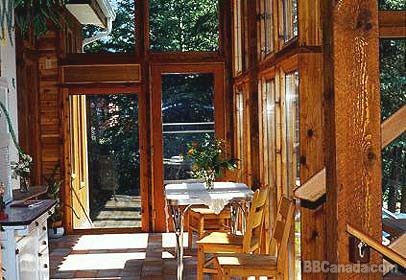 The Canadian Rockies offer a wide range of activities and you are invited to our peaceful, retreat style B&B nestled in the trees.